As mentioned before, a significant cause of the wage gap between Latinas and white, non-Hispanic women and men is the fact that Latinas tend to work in lower-paying occupations due to formidable structural barriers to entry and success in the labor market. The figure below displays the top 10 occupations in 2017 for Hispanic women and the corresponding median annual wages for these occupations. These median wages for Hispanic women range from $20,820 to $37,870. 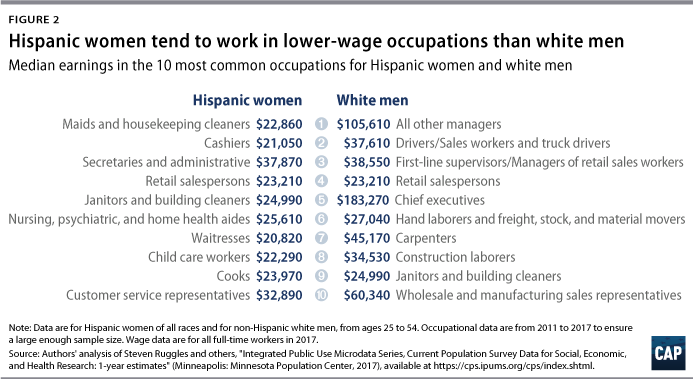 For comparison, the median wages for white, non-Hispanic men’s top 10 occupations range from $23,210 to $183,270. 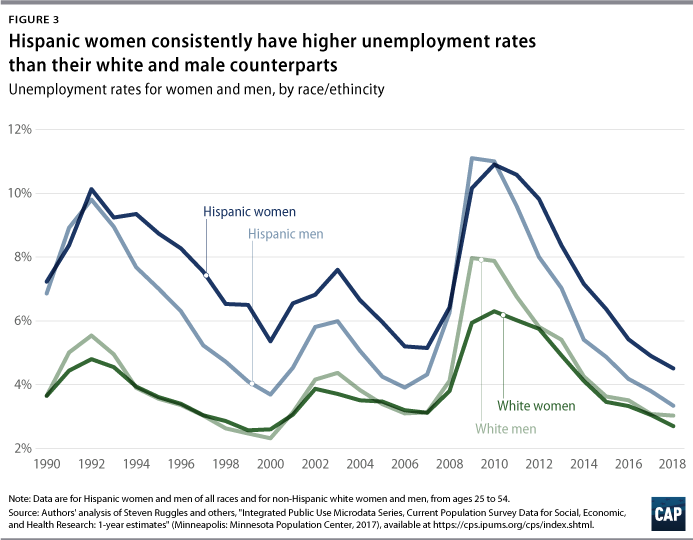 In recent history, women have had slightly lower or equal unemployment rates compared with men; however, this trend is reversed for Hispanic women. Hispanic women have higher unemployment rates than Hispanic men, while the unemployment rates of white women and men are very similar. The number of workers who are employed only part time for economic reasons—meaning they are unable to find full-time work despite wanting it—remains high compared with prerecession levels. If workers are part time because their hours are cut or because they cannot find a full-time job, that indicates a labor market that is less favorable for all workers. 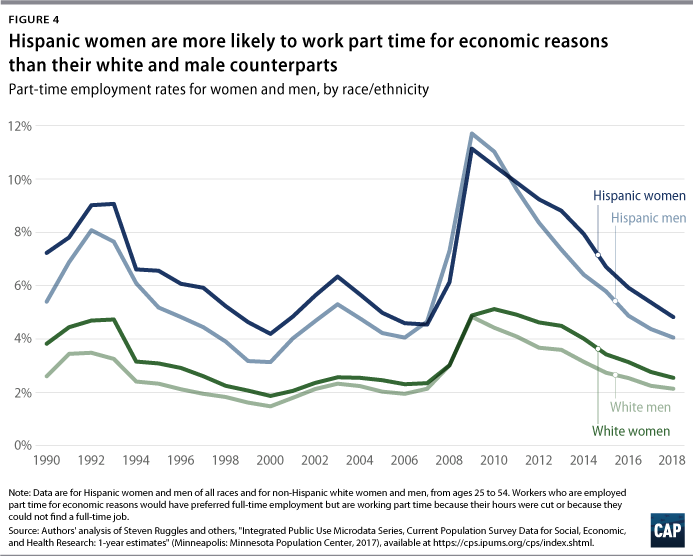 As shown below, Hispanic people are much more likely to work part time for economic reasons than their white counterparts. In 2018, Hispanic women were more than twice as likely as their white male counterparts to work part-time for economic reasons. 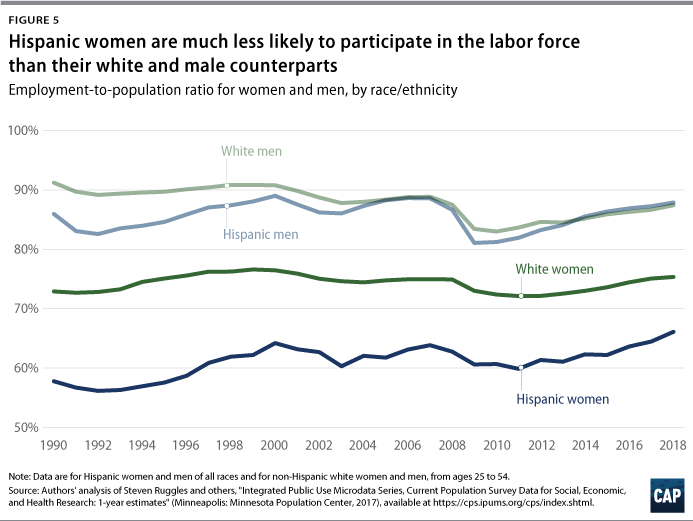 Hispanic women have a much lower employment-to-population ratio (employment rate) than Hispanic men as well as white women and men. The employment-to-population ratio is the share of the population that is employed. Although Hispanic men and white men have almost identical employment rates, there is almost a 10 percentage-point gap in the employment rates between white women and Hispanic women. More research is needed to understand Latinas’ low employment rates and to answer questions such as whether it could be due to a higher likelihood of informal employment that would not be recorded in government employment data collection. Latina workers may also be less likely to respond to government surveys such as the census. This disproportional survey refusal rate is in part driven by specific fears and suspicions of deportation and authorization, as well as general distrust in government. Comparatively lower pay and worse labor market outcomes compound to put Latinas and their families in an especially economically precarious position. Recent analysis has looked at the increasing number of breadwinning mothers and found that Latinas outpace white mothers as the primary breadwinners of their families. Yet despite how vital their earnings are to keeping their families afloat, women of color—including Latinas—experience larger wage gaps than white women, compounding the economic precarity experienced by Latinas in the labor market. The structural disadvantages that Latinas face can also be a drag on the entire economy, as these workers are not able to achieve their full potential. Policymakers and economists need to make sure to consider the challenges of Latinas and other populations that face high labor market barriers when evaluating the health of the labor market and implementing policies that affect it. Daniella Zessoules is a special assistant for Economic Policy at the Center for American Progress. Galen Hendricks is a special assistant for Economic Policy at the Center. Michael Madowitz is an economist at the Center.